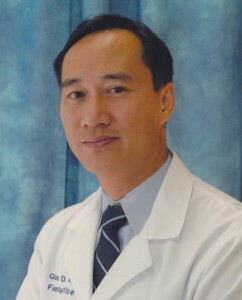 Dr. Quoc Le graduated from Yale University in New Haven, Connecticut and received his medical degree from The University of Texas Health Science Center at Houston (UTHealth) Medical School. He completed his residency training at the Memorial Family Practice Residency Program in Houston, Texas. Board certified in family practice, Dr Le has practiced medicine in northwest and north Houston since 1999. His clinical interests included diabetes, hypertension and sleep medicine. Dr. Le treats patients from 2 years and older. Dr. Le’s practice philosophy centers on providing excellent and compassionate care to his patients while concentrating on preventive medicine. He believes in taking the time needed to listen to his patients and provides the full spectrum of family care as well as Department of Transportation (DOT) physicals. A resident of Spring, Dr. Le is married and has three children. He enjoys spending time with family and working out at the gym.